3' to 6' Silhouette Spiral Snowflake Pole Mount with C7 LED 80,000 hour bulbs. Installation hardware included with 8' lead cord. 5 Season warranty on frame and 3 seasons on LED bulbs. 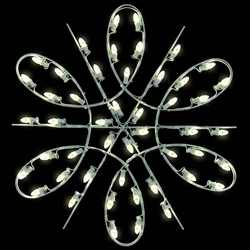 3' Spiral Snowflake has (48) LED bulbs weighs 11 lbs. 4' Spiral Snowflake has (60) LED bulbs weighs 14 Lbs. 4.5' Spiral Snowflake has (60) LED bulbs weighs 14.3 lbs. 5' Spiral Snowflake has (72) LED bulbs weighs 15 lbs. 6' Spiral Snowflake has (85) LED Bulbs weighs 17 lbs. Proudly made in the USA. Call for shipping rates on 4.5' and above.